Introducing the Kourier Quick Label solution, a powerful, easy, flexible, and affordable barcode and label printing solution for DataFlo. 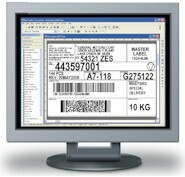 Now you can design and print virtually any label you can imagine using information in your DataFlo database. Kourier Quick Label is integrated with the world famous BarTender label printing software from Seagull Scientific. Automatically Print Labels in Background using "Commander"
Do you need new printers? Kore Technologies is a reseller for industry standard Zebra printers. We can help you select, configure, and install the best printers to meet your requirements and budget. UNIX Implementations require UNIX-to-Windows connectivity software such as Samba, Microsoft Services for UNIX (SFU), or other network file sharing (NFS) software. If you would like more information on how Kore can help you implement integrated barcode and product labeling solutions for DataFlo, contact us here. For more information on BarTender, go to the Seagull website.